Exciting news for Shintaro Kago fans... The original pages of his cereberal & formalist (dare I say?) masterpiece, ABSTRACTION are now on sale. The first two pages are priced at 10,000YEN each, while the remainder of the pages are 30,000YEN each. Big pieces with stunning & intricate line work, these would incredible piece of original art to have and hold. I emailed with Kago again this week, and he let me know that you can buy copies of a few of his manga directly from him as well. The following titles are available (+ shipping). Simply send a list of what you want to his email and he'll give you an estimate of cost. I've found he gets stuff in the mail within a day or two once you Paypal the money. Happy holidays! I'm heading to the Midwest to visit family starting tomorrow. Will try to write a few posts on the plane(s) and get them up before Christmas. Hope all of you guys are doing really well and have relaxing breaks ahead of you! I got mine on Monday. It's awesome. I want to buy more, but I'll have to see how I do in the cash department after I get this month's pay. I`ll post a pic when I get it. Thanks for posting this, that`s how I found out about it! @Scotty: The good news is that Kago seems to keep adding new stuff all the time. in the future, my friend! since I use the picture for like all of my online avatars.. I'd buy the original..but I feel like i'm spending wayy too much, and I figure the postcards are cheaper and in color if i remember correctly..
sorry for the long comment, but does anyone have an idea? Or, maybe a Same Hat reader in Tokyo would be willing to grab you a postcard set from Taco Che?? are there any translations to enlish published? i have all his manga in english but only as jpg, and i want to have them on paper! @inkynebula: unfortunately nothing officially published in English (except his story Punctures, in the Viz anthology, Secret Comics Japan). At least, that's the case for now. http://www1.odn.ne.jp/~adc52520/tuuhan/fukuseioversea.html - now also color reproductions of his works are available. At rather fair prices too. I just bought the first and sixth page of Abstraction as a Christmas present to myself. and after seeing that colored reproductions of his work are available (AND POSTCARDS!) I bought two sets of postcards and one set of the A4-size prints :D, mostly because they're awesome and inexpensive. I asked Kago to sign these. I should've asked him to sign the orignal art I got, too. drat. @dembol: very cool! My buddy nate got a print from him at design festa last fall... so cool that he's making them (and those postcard sets) so widely available! @ben: wow dude, that's a hell of a present. Congrats! @jaclyn: just left a comment onf your blog. Your original looks great :) Kago seems really happy to please his overseas fans... isn't it cool to have direct access to him? are the postcards hand drawn as well or are those printed? just wanted to say a big thanks for continually putting on an awesome blog, seriously. opened my eyes to the work of umezz and i'm reading 14, and loved pretty much all his stuff... wanted to give thanks and wish you happy holidays, and all the best! we need more blogs, and more writers dedicated to the awesome subculture that is strange anime/manga oddities that are great sources of entertainment. @anonymous: That's weird, those are both pieces that were sold direct from Shintaro Kago via his site. I wonder why you'd buy from them when you could have just bought them from Kago himself? "@anonymous: That's weird, those are both pieces that were sold direct from Shintaro Kago via his site. I wonder why you'd buy from them when you could have just bought them from Kago himself? mailorders like Timeless Shop can buy limited editions like books, original arts,... to sell later, for me is normal, i see it frecuently. But i know that is better sometimes buy those items directly from the artists, perhaps is less expensive. 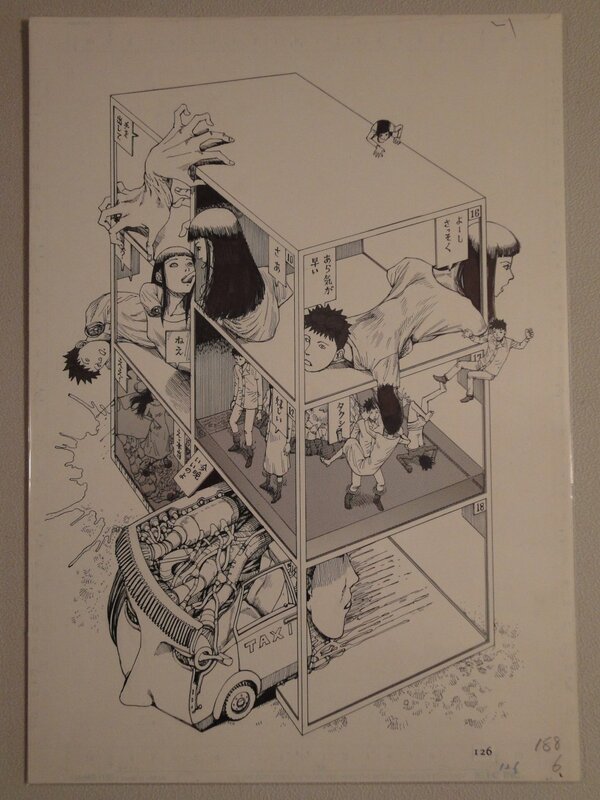 I have comics of Shintaro Kago, but i don´t have original arts, and i don´t need it and i can´t, it is very expensive. My Kago art arrived yesterday. I was impressed at how well everything was packaged, someone would have had to get creative to damage it in shipping. Oh yeah, I get what Timeless does, that's a cool shop and helpful for folks in other countries. I meant, in this specific case Kago sells direct to overseas folks so there's no need for a middleman. I just ordered the piece 'Kantuu' from his site. Don't know if this already common knowledge? No other info I'm afraid but its something to look forward to. @Tom: innnnteresting. I talked to Kago a little about that exact topic but don't know of any confirmed stuff yet. That would be awesome, of course!